KBR 모바일 사이트, Why did ER resident visit police station 5 times in 3 years? The medical community was enraged over a recent assault on an emergency room (ER) physician in Iksan, North Jeolla Province, not merely because of the violent act. Doctors expressed more anger after learning that the police did not respond to the offender seriously. The incident has many precedents. Whenever a drunkard, a patient, or a guardian attacked a medical worker, the authorities ended up giving a slap on the wrist on the perpetrator. There is a doctor who takes a strong response to such assault in the ER. 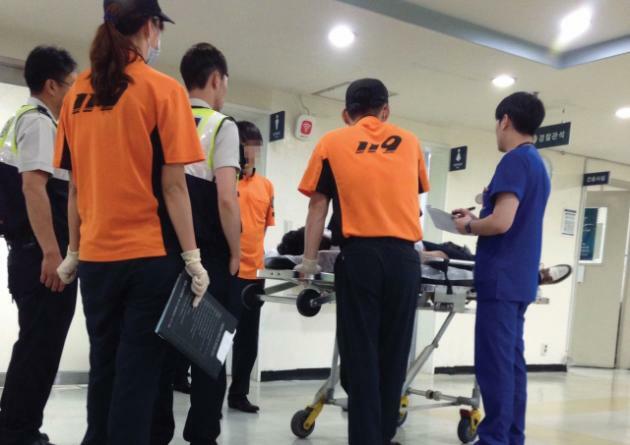 Korea’s 119 paramedics visit an emergency room carrying a drunk patient. Jeong Yong-wook, a third-year resident at emergency medicine department of Hallym University Sacred Heart Hospital, reports an assault case to the police and takes a firm stance that he would sue the offender for the violation of the Emergency Medical Service Act. During his three-year training at the ER, he went to the police station five times after suffering assaults by a patient or a guardian. Jeong recalled when patients or guardians, who had assaulted medical staffs once, would come back again to attack him verbally. “Threats were so common. Unless the police are involved, they could put me in danger, too. I thought I had to be protected,” he said. Whenever Jeong witnesses a violent case in the ER, he immediately reports it to the police and makes it clear that he would sue the offender for the violation of the Emergency Medical Service Act. His active responses changed the way the police deal with violence in the ER. “Police officers used to say ‘drunk people can be like that’ but now they don’t say so anymore. They neither try to take it lightly nor talk me into canceling the suit,” he said. Still, Jeong sees many drunk patients in the ER he works every night. Half of the visitors to the ER with light symptoms are drunk, he said.